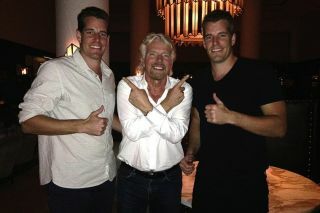 The Winklevoss twins Tyler and Cameron pose for a photo with British billionaire Sir Richard Branson, founder of the Virgin Galactic spaceflight company. The Winklevoss twins have purchased two tickets to fly on the company's SpaceShipTwo space plane. The Winklevoss twins launched into the headlines Wednesday (March 5) by announcing their plan to ride a Virgin Galactic space plane (and paying with Bitcoins, no less), but they aren't the first set of identical twins to fly in space. NASA, it turns out, got there first. Years before the Winklevoss twins planned their Virgin Galactic space trip, the identical twins Mark and Scott Kelly — both 50 — of West Orange, N.J., were busy flying space shuttles for NASA. Not only are the Kelly brothers the first identical twin astronauts in history, but they were also simultaneous captains in the U.S. Navy until Mark Kelly retired from both NASA and the Navy in 2011. NASA astronaut Scott Kelly (left), Expedition 26 commander, is reunited with his twin brother, Mark Kelly on March 17, 2011, following a flight back to Ellington Field, Houston from Kustanay, Kazakhstan. Scott Kelly landed in Kazakhstan on March 16 with his Russian crewmates in the Soyuz TMA-01M spacecraft after 159 days in space. Now when it comes to the Winklevoss brothers — the founders of Winklevoss Capital investing group — this part is key. The Winklevoss twins could be the first identical siblings to fly at the same time. The Winklevii are paying the Bitcoin equivalent of $250,000 for the suborbital spaceflight. Virgin Galactic is offering trips into suborbital space (they don't reach Earth orbit like NASA shuttles) by launching the SpaceShipTwo vehicle from a high-altitude mothership called WhiteKnightTwo. The SpaceShipTwo can carry two pilots and six passengers per flight. The Kelly brothers never had the chance to fly in space together, though at one point it was planned. In 2011, NASA hoped to launch its second-to-last space shuttle mission — the STS-134 flight on Endeavour — early in the year, during the time that Scott Kelly was in command of the International Space Station. Mark Kelly, meanwhile, would command Endeavour. It would be a historic identical twin space commander flight. But Endeavour's launch was ultimately delayed until May 2011, two months after Scott Kelly had returned to Earth. In June 2011, Mark Kelly retired from NASA and the Navy to be able to spend more time with his wife, former Arizona Congresswoman Gabrielle Giffords, who was shot in the head in early January of that year during a failed assassination attempt. Giffords survived and underwent a series of surgeries and intense rehabilitation. She watched Mark launch into space from NASA's Kennedy Space Center on May 16, 2011. Scott Kelly, meanwhile, remains an active NASA astronaut and will return to the International Space Station in 2015. That mission is slated to be an unprecedented one-year space mission for NASA. Scott will be joined by Russian cosmonaut Mikhail Kornienko on that mission. The Kelly twins have volunteered to be guinea pigs for biological studies on the effects of long-duration spaceflight during Scott's year-long mission.